how much honey are the small cell bees bringing? This is a very special topic. Those who are against us, for whatever interest, claim publicly that our bees are not rendering ANY honey. Therefore I got the idea to ask our colleagues in the English speaking forum, who all work with small cell bees, what their honey harvests are like. Of course, extremely high yields were never the criteria for our breeding and throughout the past years, due to not very helpful weather and the process of adapting to the new system our primary focus were on the capability of the bee to defend herself against diseases by her own power. Bees are dying everywhere even though they are being treated and ours, which were never treated, can proliferate diligently. Two years ago, there were 160 hives, 220 last year and now I have a few more than 300, and now they bring honey. - Erik from sweden told me of a colony which brought him no less than 200kg - to be seen on the picture - this is of course an exception and he said that he had very bad years with an average of 13kg per colony and very good years with 100 kg per colony. 40kg is the norm. And WITHOUT artificial feeding. - Dee Lusby answer was alike. In Arizona the problem is that there may be several years in a row without rain. 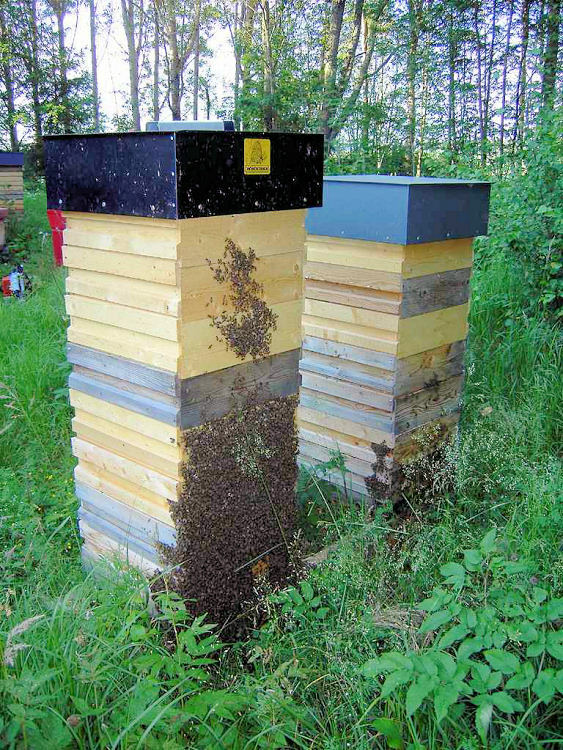 But when it rains the regular amount is 40kg per colony and 100kg are not a problem with a strong hive. - Mike Palmer at Champlain Valley, USA, harvested 41 tons of honey from 750 hives of small cell bees. That is in average 55 Kg per colony. - Michael Bush, SO Nebraska, USA says that there were very bad years without any income and outstanding years with an "average" of 100kg per colony. But usually it is between 10 and 50kg per colony. Do small cell bees bring honey or not?